The Fundamentals of an Air Source Heat Pump. Are you interested in installing an air source heat pump but are not sure of what this process entails? We’ve put together the fundamentals of an air source heat pump starting with how it works, the installation process, and finally, their efficiency. In an air source heat pump, heat energy is delivered from the air to the refrigerant which has a very low boiling point. This happens in the evaporator. The refrigerant changes from liquid to gas and passes to the compressor where it is pressurised. The increase in pressure increases the temperature. Heat is then delivered to water at the condenser, ready to be distributed to your hot water tank, radiators and underfloor heating. The refrigerant passes through an expansion valve where it drops in temperature. It becomes liquid once more, ready to start the process again. If you are building a new home, your first step is to send your plans to your heat pump supplier. From that, they can give you detailed calculations, heating plans and a quote. No visit required! Following your quote, the next step is to meet with your chosen supplier. If you require an Energy Saving Trust loan, your supplier should be able to guide you through that process and give you the information you require. If you do apply for the loan, you will need to wait until that has been granted before work starts. Once you are happy you have all the information you require, the next step is to work out a timetable that suits you to install your new heating system. However, if you are replacing your heating system, your first step is for your potential supplier to visit you at home so they can access your property to understand your requirements. From that they can give you detailed calculations, heating plans and a quote. Following your quote, the next step is to meet with your chosen supplier. If you require the Energy Saving Trust loan, your supplier should be able to guide you through that process and give you the information you require. If you do apply for the loan you will need to wait until that has been granted before work starts. TOP TIP! Confirm with your supplier that they will be responsible for commissioning your heat system and that they will service and maintain it. So how efficient and reliable is an air source heat pump? One of the many great benefits of your air source heat pump is that it is an incredibly efficient form of heating. It can exceed 350% in terms of efficiency, simply because it transfers heat rather than work to generate it. By having larger radiators and underfloor heating, you can maintain this level of efficiency as your heat pump doesn’t have to work to such high temperatures. The lower the temperature of the water that flows through your radiators, the greater the efficiency. Measuring your heat pump efficiency. The efficiency of your air source heat pumps is measured by the Coefficient of Performance (COP). This is the ratio of output compared to the required input. For example, a COP of 3 means your heat pump produces 3 units of heat energy for every 1 unit of electricity it consumes. COP only measures the efficiency of the heat pump over the year and not the system in full. SPF takes into consideration the design of the heating system and performance over the year. It essentially shows how efficiently your air source heat pump systems can heat your home under the best possible conditions. Using this scale, an air source heat pump efficiency can be as high as 4, whereas ground source heat pumps can reach up to 5. This means that for every unit of electricity you put in, the heat pumps have the potential to produce 4 and 5 units of heat respectively. By comparison to other forms of heating, electric heaters work at around 100% efficiency. One unit of electricity produces one unit of heat. Even brand new oil and gas boilers only work at around 90% efficiency. So there you have it, the fundamentals of an air source heat pump. 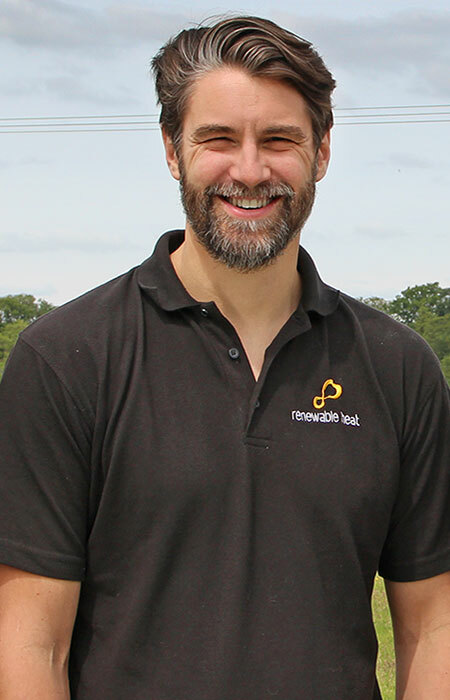 I founded Renewable Heat in January 2015 with my business partner Richard Hailstones. I have worked in the Plumbing and Heating Engineer sector for more than 15 years. I later went on to specialise in the renewable energy market as it emerged and grew.